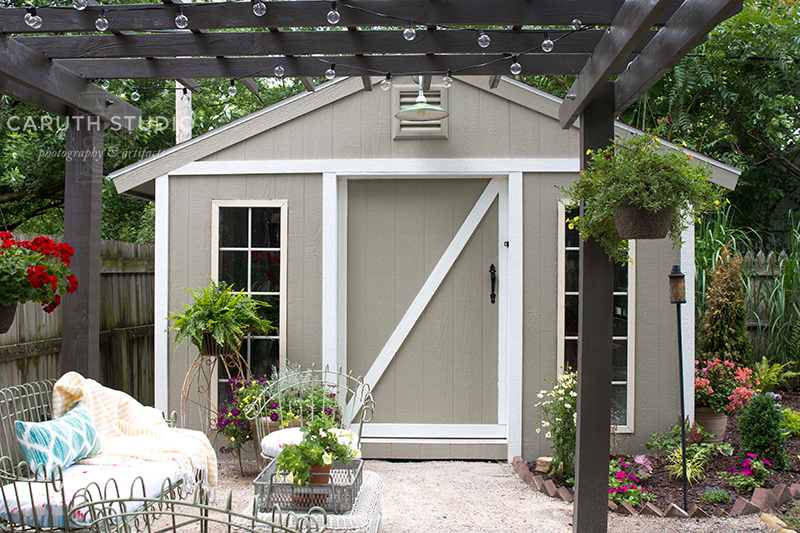 By asking herself how she really wanted to use her underperforming living room to function, a homeowner creates a multipurpose space that becomes central to the house. This room was underused as so many formal living rooms are. Furnishings were spread around ice-blue walls with no thought about how the room might function, other than as a place for seating when company comes. 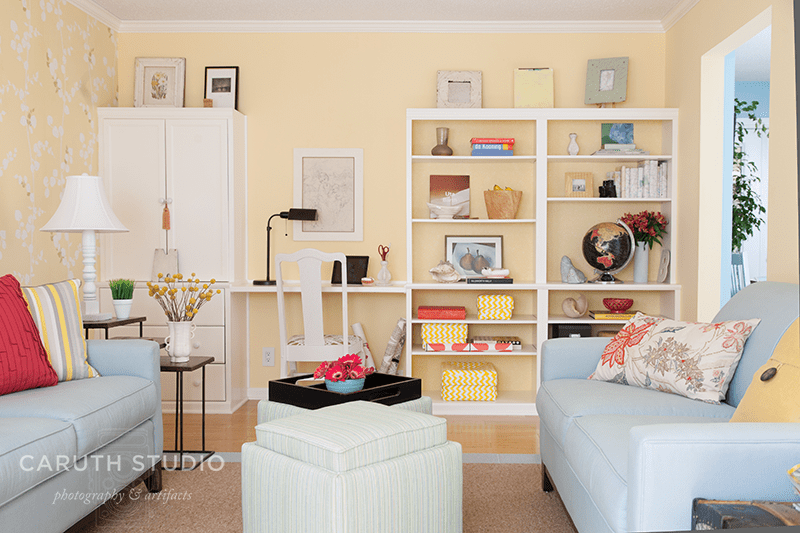 With the addition of a work station, a warm color scheme, and better conversation groupings, it turns into a living room that looks good when company comes, but it’s now more hardworking and inviting for the people who use it every day. To increase the room’s functionality, a shelving system was installed along one short wall. Two step-back case units placed side-by-side fill one corner. A drawer-and-cupboard unit fills the other. In between, an assembled desktop bridges the gap and creates a unified built-in look. Open shelving holds items both decorative and useful, linking the work and seating areas. Using the wall paint color on the back of the shelving units, the shelves themselves blend with the room so that the objects take on more presence. Pretty storage boxes keep office and crafts odds and ends looking tidy and attractive but within easy reach. A vintage architectural finial, drilled as a container, becomes a statuesque pencil holder. Show off your love of travel by using maps as book covers. Cut a rectangle that’s a few inches taller than the book and several inches longer than the width of the book’s front and back covers—plus the spine. Fold in the top and bottom edges to fit the book’s height. Bending and wiggling the paper rectangle as needed, slide its folds onto the front and back covers of the book. The cupboard-and-drawer combo in the corner offers more storage options to ensure that office-related supplies don’t clutter up the desk area. 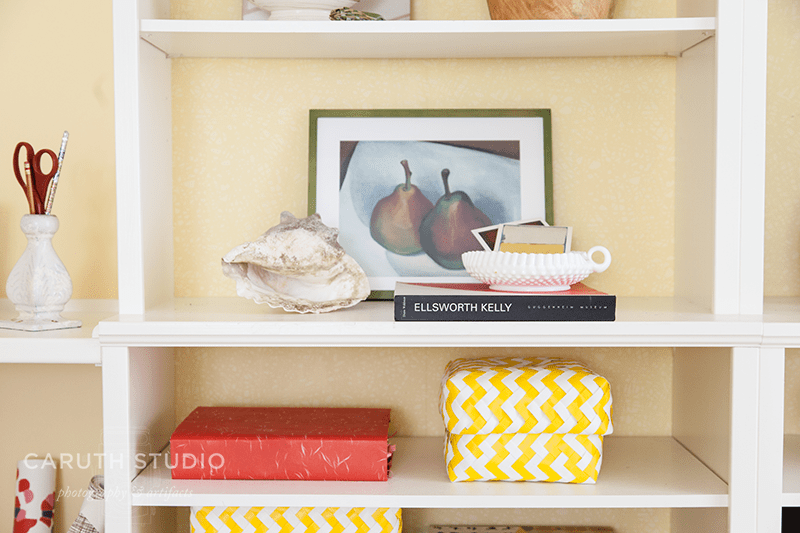 Shelving is secured to the wall for stability and trimmed with wood molding to enhance the built-in look. Don’t overlook the display potential to be found on top of shelves and cabinets. Twin loveseats create a cozy conversation area that doesn’t face the work zone, but the desk chair is attractive enough that it can be turned to offer additional seating without sacrificing either comfort or style. 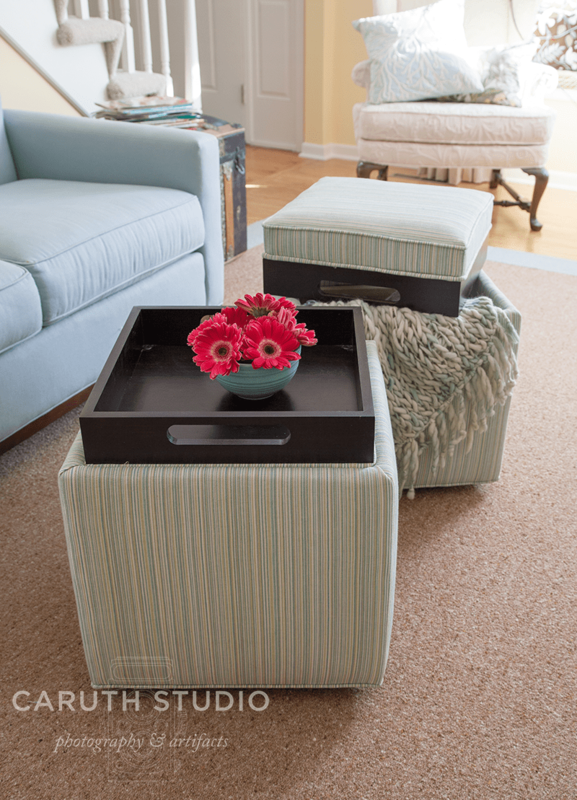 Upholstered storage ottomans, each with a cover that flips to a tray, combine to suggest a coffee table between the sofas, but take up less space and can separate for extra seating when needed. One long wall comes alive with a pretty botanical paper. The ground matches the buttery hue of the other living room walls while the pattern is subtle enough to add interest without overwhelming. Old trivets, plates, and platters, some with glued-in mirror shapes, complement a divided mirror. Create affordable accents with the push of a spray paint button. 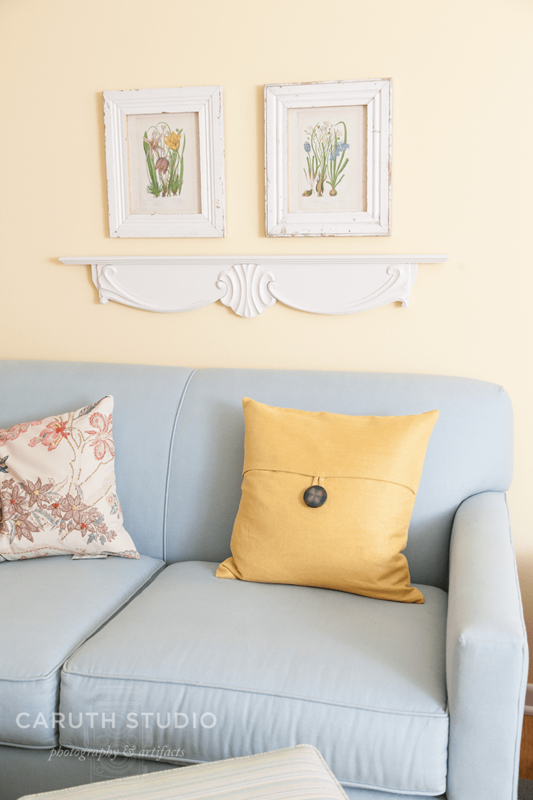 Lamp bases, fashioned from turned stair rails, picture frames, the desk chair, and even a little terracotta pot look crisp and clean thanks to a fresh coat or two of white paint. 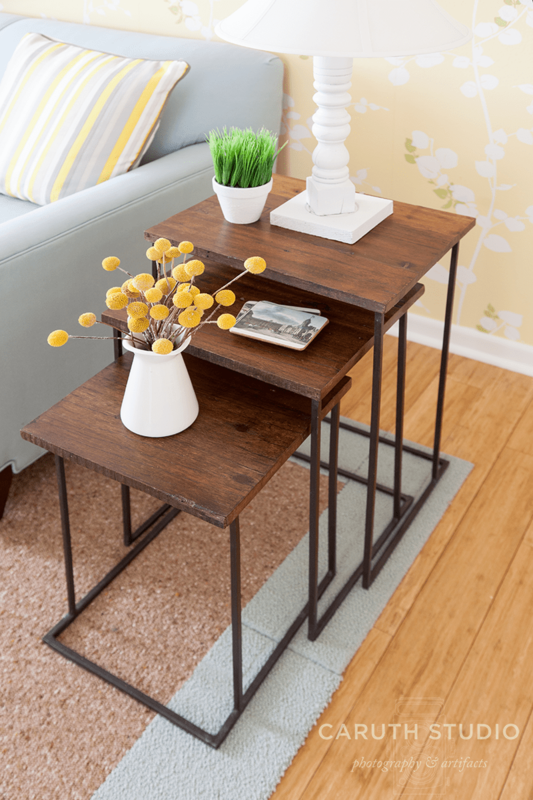 Nesting tables are ideal solutions for smaller rooms. The simple metal and wood construction is light on its feet visually and in this stepped formation, they’re ample side tables. But when company comes, they can be rearranged to hold drinks or snacks next to makeshift seating. 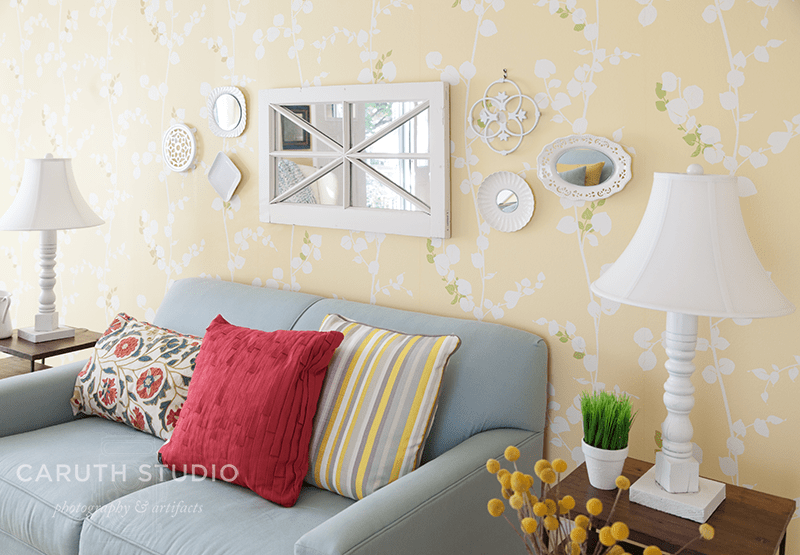 Framed botanical prints above the loveseat echo the floral theme of the opposite wallpaper. 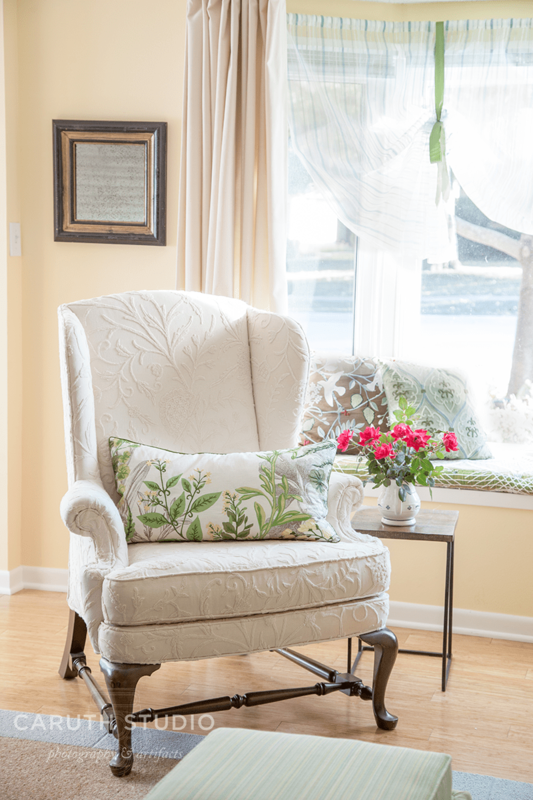 A graceful wing chair on the other end of the living room establishes a little formal character and provides a cozy spot for a quiet read. A great piece of fabric that may have a defect isn’t necessarily cause for dismay. 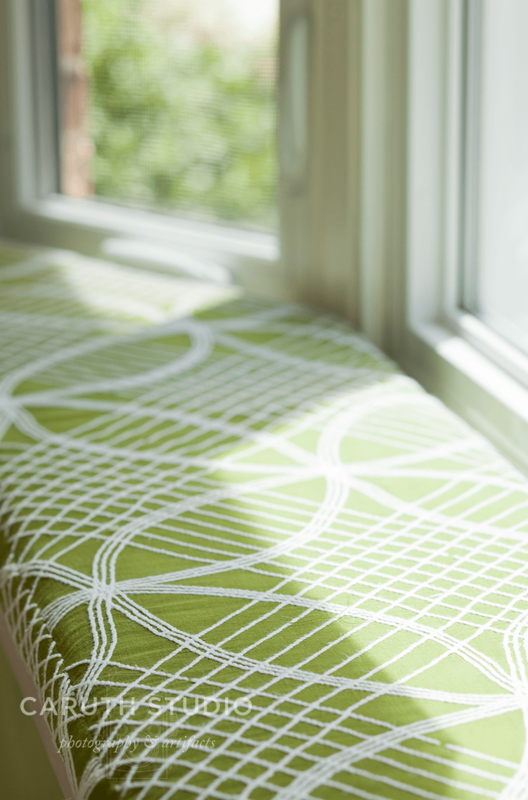 For our window cushion, we used the reverse of an old chenille bedspread remnant adding a texture-rich pattern to the nook. We used the same fabric on the desk chair across the room, tying the two sides together. 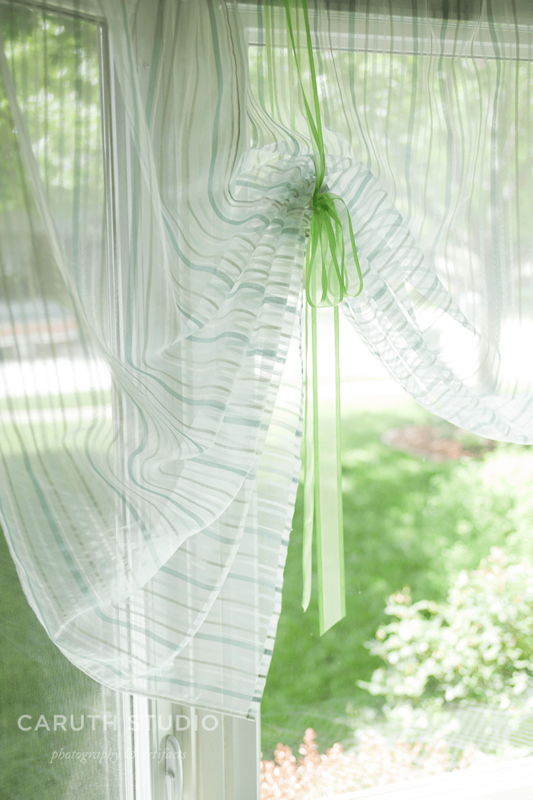 Sheer aqua stripe fabric makes a light gathered shade at the bay window, allowing light to flood the south-facing room. This is one living room I would have a hard time leaving. Who says they’re only useful when you have company? I agree! The original design was done by Pam Porter. She has a great eye!